Even though I have been paddle boarding for a while now, I still wipe out every now and then. This is why I make sure to wear a personal flotation device (PFD) when heading out onto the water. I also encourage all other riders to put on any kind of life vest as well. Of course, finding the best SUP life vest/PFDs was a lot more work than I imagined. It took me quite a while to figure out the right options for paddle boarding and even then, I had quite a few products to sort through. So, I decided to put together this guide to make this task a lot easier for you to manage on your own. Here, I have included some advice on how to select the best PFD for you. I have also mentioned some of the life vests and PFDs that I would recommend as excellent. Perhaps the first thing that you should be aware of is that you can’t wear any old life vest or PFD when riding an SUP. This is because, for the most part, many vests are more concerned with safety rather than function. While safety is certainly important, it isn’t the only factor to consider when paddle boarding. See, on an SUP, you are going to need to move your arms around while paddling. 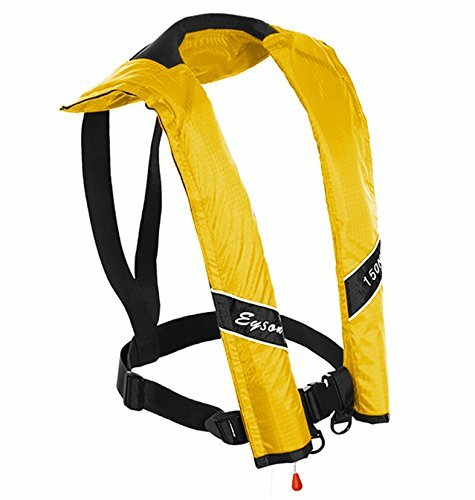 To accommodate this, PFDs and life vests for SUPs have almost a cut-away design so that you are given freedom for movement. 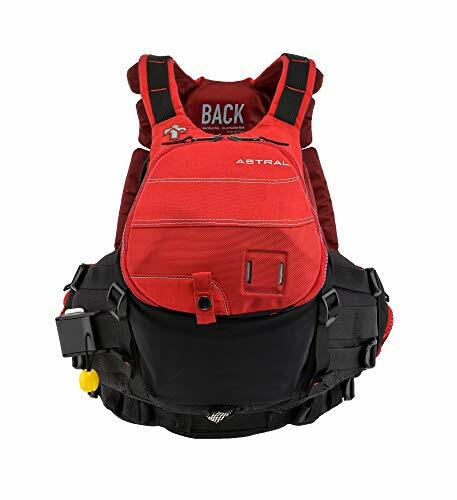 When selecting a PFD for paddle boarding, this is one of the first things to look for. While these may not be the most buoyant of PFDs, they do have the advantage of being more comfortable. This, of course, is due to the fact that these life vests are less bulky, and make it easier for you to move your arms around. This type of PFD works best if you relatively close to the shore if you are paddling with others that can help you out if you fall into the water. Keep in mind that these life vests will not turn you over if you are unconscious in the water. So, they may not be suitable if you are paddling out by yourself. If you select a Type III device, make sure that it has a minimum buoyancy of 15.5lbs for an adult. 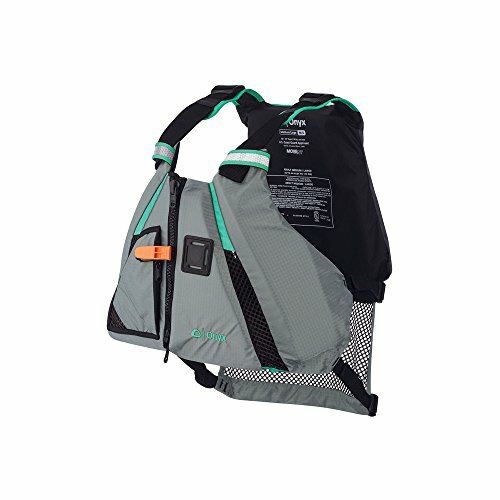 Type V PFDs have the least amount of coverage and are incredibly light to wear. As such, they make paddling a great deal easier. At the same time, this type of PFD doesn’t have too much buoyancy. Therefore, you should only get one if you are an experienced rider and a strong swimmer. 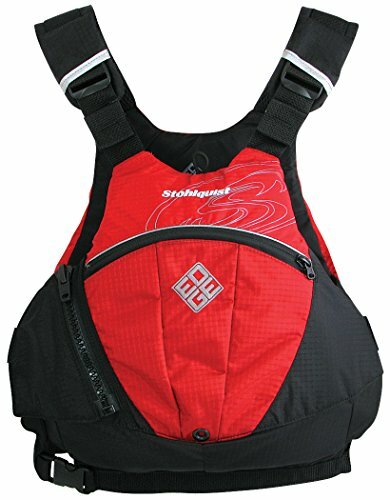 Make sure that the buoyancy for this kind of vest is between 15.5 and 34lbs, depending on the style of the PFD. After the design and type, the next decision that you will be required to make is regarding an inflatable or a non-inflatable life vest. As the name suggests, inflatable vests are inflated only once you are in the water. Due to this, these PFDs tend to have a rather slim profile and are practically weightless. So, they are a great deal more comfortable to go paddle boarding in. They aren’t, however, suitable for poor swimmers or children as they may lack the necessary buoyancy. Now, these PFDs come in two different types. The first is the self inflating vest – with the help of a carbon dioxide cartridge this begins to inflate the moment that you hit the water. the other is the manual where you have to tug on a feature for the life vest to begin inflating. Both of these options are equipped with a fail-safe feature. These are the PFDs that most people are familiar with. The main benefit of these vests is that they are consistently buoyant. So, if you do fall into the water, there is no delay in you bobbing back up to the surface. This makes them quite safe for those that aren’t very strong swimmers. This does mean, though, that these vests can be on the bulky side. What’s more, they have a little bit more weight to them as well. I would argue that apart from buoyancy, the most important element of a PFD is the size. After all, there is little use in investing in a high quality life vest if it doesn’t fit you! The action of the PFD will be greatly compromised as a result of a poor fit. You should know that every manufacturer have their own sizing guide. Therefore, it is best not to go according to labels such as “small”, “medium”, “large”, etc. Instead, focus on the measurements provided with each PFD. Make sure to measure various parts of your torso and to compare these measurements to the life vest that you wish to buy. Only get one that you are sure will fit you. When you try on a PFD for the first time, see if you can fit three fingers between the vest and your shoulder. If you can, this is a sign that it is too large. There are PFDs that have been designed specifically for women. So, if you are a woman, should you get one? Well, that really does depend on your size. As long as you can find a life vest or PFD that fits, you will be fine. However, if you have a shorter torso, smaller torso, or a larger chest, then a women’s specific life jacket may be best for you. Understand, these vests have been especially made to fit the proportions of a female body. So, there may be riders out there who find these to be a much better fit for them. One of the things that I like most about this jacket is the low profile. The curves and the beveled edges are all in just the right spot and have been made in a way that allows me full movement with my arms. Due to this, paddling is an absolute breeze. I found that the fit of this life jacket was also quite good. This is due to the fact that the manufacturer has taken care to adjust the design to the different sizes. So, not only does it offer a better fit but it is more comfortable as well. That being said, I will admit that this vest is a tad bit bulky in the front and the back. So, if you aren’t all that tall, it can be a bit tiresome to wear after a while. Fortunately, the mesh on the sides do help to make it more breathable. As far as buoyancy goes, the foam padding does an excellent job of keeping me face up in the water. The nylon outer covering is also pretty hardy and made from rip-stop nylon, ensuring that this jacket will last quite a while. Last but certainly not least, this vest is approved for use by the coast guard. There is quite a bit of room around my neck and arms when I put this vest on. So, I’m free to paddle without any restriction at all. Even after hours of paddling, I found that there was absolutely no rubbing or chaffing. Furthermore, the vest has been designed in such a way that it conforms to your torso nicely so it moves like you do. This comes in handy when I’m paddling as the vest doesn’t get in the way. I will say, though, that the front part of the vest is pretty bulky and that did take some getting used to. What I did notice about this vest, though, is that the size options are pretty great. You can select a vest with dimensions ranging from 28 inches to 56 inches around the chest. So, you shouldn’t have too many issues finding one that fits you too. You can also make adjustments at the shoulder and your sides to make the vest fit more comfortably. Another positive feature is that the vest is made from both Oxford nylon and rip-stop nylon. So, if you are paddle boarding near rocks or boulders, you don’t have to worry about it getting damaged. If you want as much buoyancy as possible, then I would say that this is a good option for you. This vest boasts a buoyancy rating of 16.4lbs so you can be certain that it can keep you float in all conditions. In fact, if you like taking your paddle board out onto rougher waters, this could be just the PFD you need to keep you safe. In fact, this PFD is made from exactly the kind of tough, durable material that is sure to withstand these kinds of conditions without any issue at all. For the most part, this PFD offers up a pretty good fit. It accommodates chests from between 31 to 51 inches. To add to this, you can also adjust the torso height so that it offers up a more customized fit. The two-panel design also works to cut down on the vest riding up as you are paddling. This is also what allows for plenty of movement of your arms. Despite this, I wouldn’t say that this is a good option for some women. The front design of the PFD may make it uncomfortable for them to wear. What I love about this PFD is that it does not get in the way at all. It is cut low around the arms and the chest. So, I can paddle as quickly or change positions as I want and will not experience any interference at all. For this, the PFD gets top marks. Now, while the PFD is hardly flat, it isn’t overly bulky either. Therefore, you should get used to it being strapped to your chest fairly easily. While the foam panels do an excellent job of keeping you afloat, they too don’t get in the way of your arm movement. Now, it should be noted that this PFD tends towards larger sizes although it does accommodate shorter torsos. If you are on the smaller side, then there is a good chance that this PFD will not fit you. If it is within your size range, though, then you can hope for a good fit. The side and the shoulder adjustments are easy enough to make and can provide you with a more tailored, more snug fit. The PFD is made from some pretty durable material as well. So, you don’t have to worry about it tearing or getting damaged. If you want the safety of a life vest but can’t bear the weight of a bulkier jacket, then this harness acts as a good promise. The PFD goes around your neck and down the front portion of your torso in two slender strips. There are straps holding it in place. Now, this PFD isn’t inflated but can be manually triggered when you are in the water. Due to this, there is no additional weight to this PFD at all. It really is one of the more comfortable options that you can wear out on the water. I was pleasantly comforted to see that the PFD inflated rather quickly once I pulled the cord. Within around five seconds, it was already ballooning up and pushing me to the surface. What’s more, this PFD will stay inflated up to 48 hours after the initial action. Despite this, I would not recommend this PFD for anything other than flatwater paddle boarding. It is unlikely that it will hold up to anything more severe than this. This vest offers up a universal fit for adults and can hold up to 330lbs in weight when in the water. If you are a more experienced paddle boarder like me, then the idea of wearing a life vest isn’t all that appealing. Still, there are some cases when you need to have one on. If you want to do away with the bulk of some of the other styles, then I would suggest this PFD belt. The entire vest is secured inside the belt until you need to release it. Then, a proper life vest pops out. As for the actual inflation process, it doesn’t take more than a few seconds to get the PFD all blown up and ready to use. Of course, this isn’t an option for many paddle boarders. It is only a good idea if you are in calm water and if you are indeed a strong swimmer. Otherwise, you may find that this life vest doesn’t provide you with as much support as you require. Now, the belt is a good fit for most people. It has been designed to fit people with waists up to 50 inches. 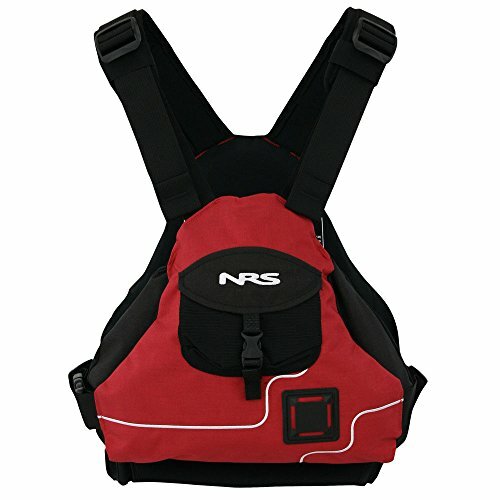 Once the PFD is inflated, it too can fit a wide variety of chests and can be easily secured within a short time. All of these PFDs and life vests are excellent options. However, if I had to select just one, I would go with the Onyx MoveVent design. This is a vest that has been specifically designed for movement, making it perfect for paddle boarders. At the same time, it is incredibly safe and provides buoyancy for riders of all sizes. Last but not least, this PFD is a good fit for many different people. This is what you need to know about selecting an SUP life vest or PFD. Now that you are armed with this information, it is just a matter of choosing the right one.